Dynamic Seating Evidence: What Does the Research Say? If you have been reading our blogs, thanks! You have seen that we are passionate about Dynamic Seating and have addressed many issues in these blogs and in other resources – clinical indicators, case studies, clinician and supplier perspectives, funding, maintenance and more! In this blog series, I would like to address Evidence. Is there Evidence for the use of Dynamic Seating? Cimolin, V., Piccinini, L., Avellis, M., Cazzaniga, A., Turconi, A. C., Crivellini, M., & Galli, M. (2009). 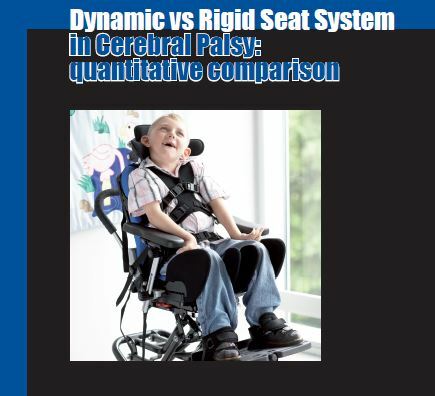 3D-Quantitative evaluation of a rigid seating system and dynamic seating system using 3D movement analysis in individuals with dystonic tetraparesis. Disability and Rehabilitation: Assistive Technology, 4(6), 422-428. This study was done by Fumagalli in Italy. Quantitative movement analysis using 3D kinematics and pressure distribution was used to compare movement during an extensor thrust with a dynamic back and with a rigid back in ten people with cerebral palsy and dystonia. An R82 x:panda seating system was used. Participants experienced decreased extensor thrust forces, increased range of motion in the anterior-posterior direction (the client could move their trunk forward and back), decreased vertical trunk movement during extension (shear) and decreased upper extremity movement (reduced large UE movement and increased smoothness of movement). The authors concluded that this could lead to increased occupant comfort (decreased pain) and quality of postural stability. The goal of this study was to determine the effects of a dynamic seating system (movement at hips and knees) as a therapeutic intervention in children with cerebral palsy. The study included twelve children: half received static seating and half received dynamic seating. Each child was evaluated in the areas of range of motion, muscle tone (Modified Ashworth Scale), motor function (Gross Motor Function Measure), and level of disability (Pediatric Evaluation of Disability Inventory) at initiation, 3 months and 6 months. A Kids Rock wheelchair was used. Both groups improved in motor function (particularly in Sitting and Crawl/Kneel) and level of disability (self-care, mobility, social function). The authors concluded that a larger, more homogeneous group would likely show significant differences in muscle spasticity, gross motor function and disability. Trends showed a decrease in spasticity, an increase in range of motion and improvement on the GMFCS (Gross Motor Function Classification System) for crawling and walking. The objective of this study was to examine the effectiveness of an experimental dynamic wheelchair seating system designed to relieve discomfort for long-duration wheelchair users. The study used the Tool for Assessing Wheelchair discomfort (TAWC). Two wheelchair users each tested an initial design and feedback guided the development of a second design. The study found that dynamic seating reduced spasticity intensity and contact pressures, improved postural stability, increased comfort (decreased pain), improved function, prevented damage to the seating system, and increased vocal and/or breathing ability. Two of these studies are now 10 years old and one is 12 years old. Dynamic Seating design has improved since that time. The first study used the x:panda seating system which is still available and relatively unchanged. The second study used the Kids Rock wheelchair, which is no longer available. Finally, the last study used an experimental design. Benefits were observed in each study, though the first study shows the most benefit using a larger group of participants. Look for our next blog where we will continue to review available research. Please see our Literature Review for more information. One of the most common questions I hear from people regarding Dynamic Seating is whether we have evidence to back up the use of this intervention. While more evidence is always needed, a number of studies have demonstrated the efficacy of Dynamic Seating in a number of areas.